G&G manufacture robust, long lasting signs from a variety of materials. For permanent signs the materials that we supply range from Highways grade Aluminium, Steel and Traffic Dibond™ used in the manufacture of traffic signs to ISO Standards.. Faces feature digitally printed OR screen printed faces - with the added benefit of laminated faces to protect the sign face from graffiti and UV fade. Not only do we give you a huge range of material choice - we can also offer the sign faces in reflective material - enhancing the performance of the sign in the winter months and also having the benefit of a 10 year warranty on all reflective signs. 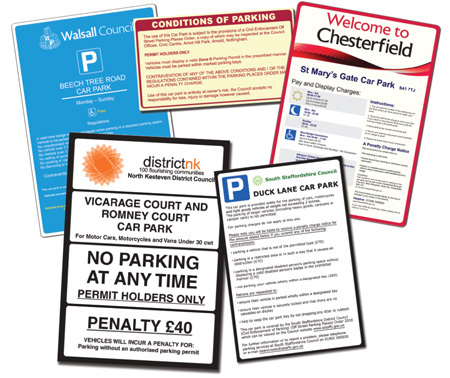 Non-standard car park signs are our forte - bespoke signs layouts are no problem - with our in house designer we can create a conspicuous clear sign from your instructions. We also supply a selection of stock signs. Pay Here cones are available in any colour. We offer a choice of three standard types of cone: two sided wall fixing, three sided post fixing and four sided post fixing or fabricated to your specification.